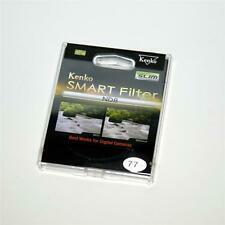 The Kenko Smart ND8 filter has a slim 4mm ring and will accept a lens cap. Includes hard case. Make Supersized Seem Small. Get Images that. United Kingdom. The Hoya HMC UV Filter is a multi-purpose, fine-weather filter that is designed to optimize the photography experience of digital SLR users. UV filters absorb ultraviolet rays that often make outdoor photographs hazy and indistinct, and can be constantly fitted to a lens to provide improved clarity and colour balance, as well as to provide protection to your lens. 1x Kenko 67mm UV Filter. This UV filter is a useful tool to minimize the affection of Ultraviolet Rays. Ultraviolet Rays will cause a bluish cast in your photos and it often makes outdoor photographs hazily and indistinctly due to the Ultraviolet Rays cause atmospheric haze. 1x Kenko 49mm UV Filter. This UV filter is a useful tool to minimize the affection of Ultraviolet Rays. Ultraviolet Rays will cause a bluish cast in your photos and it often makes outdoor photographs hazily and indistinctly due to the Ultraviolet Rays cause atmospheric haze. This macro filter set consists of four close-up filters allowing the photographer to achieve professional results at low price. 1 x Blower Brush(Free gift). Each close up lens maintains resolution and picture clarity while magnifying image size. 6pcs 58mm Graduated Color Filter: Graduated Orange Green Yellow Purple Grey Red Filters Graduated color filters provide a gradual color transition for a smooth blending effect. Give your landscape and skin texture a more colorful touch. Perfect for changing the mood of a picture. This filter is double threaded allowing additional filters to be screwed one over the other. Using two color graduated filters rotated 180 degrees relative to each other allows different colors to fade into each other. High quality metal and resin construction. extremely solid and lightweight. No wobbling or cross-threading. Filters Case:. 62mm UV CPL FLD ND2 ND4 ND8 Filter Kit for DSLR Digital Camera For 3pcs ND2 ND4 ND8 ND Filter Set To enable slow shutter speeds to be used, especially with fast films, to record movement in subjects such as waterfalls, clouds, cars, seas, etc. To decrease depth of field by allowing wider apertures to be used, which helps separate subjects from their background. To decrease the effective ISO of high speed film (ie: above ISO400) and allow it to be used outdoors in blight situations. To allow cine and video cameras (which have fixed shutter speeds) to film subjects such as snow, sand or other bright scenes which would normally cause over-exposure. Circular & Threaded Filters. Thread Size: 77mm. Lens Hoods. Lens Hood Accessories. Improves contrast by minimizing the amount of ultraviolet light. This gives astounding sharpness and clarity to all your photographs. Absorbs the ultraviolet rays which often make outdoor photographs hazy and indistinct. This multi-purpose, all-around filter can serves as a permanent lens protector. Filter Accessories. Digital multi-coated filters greatly reduce the appearance of lens flare and ghosting caused by reflections. This effect is often used to increase the contrast and saturation in blue skies and white clouds. Polarising filters do not affect the overall colour balance of a shot. Rest of World United Kingdom. This effect is often used to increase the contrast and saturation in blue skies and white clouds. HOYA's polarising filters do not affect the overall color balance of a shot. 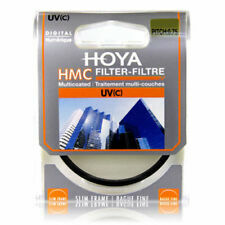 The Hoya HMC (Hoya Multi-Coated) Digital Filter is renowned for its ability to minimise reflection at the filter surfaces which reduce flare and ghosting. Hoya HMC (Hoya Multi-Coated) Digital Filters. UV Filters A UV filter is used to reduce UV rays from entering the lens and striking the film. Modern lenses often have UV protection built into them as well as digital sensors, however, UV filters are commonly used to help protect the surface of the lens from scratches, smudges, dirt and other hazards. CPL Filters A polarizer is different than most filters in that it is composed of two pieces of glass, mounted independently inside a round frame so that one can be rotated relative to the other. As it is rotated, it increasingly cuts out glare and haze. With an SLR, you can actually observe this change through the viewfinder. Polarizers reduce glare from water, glass, or any non-metallic surface. You can also use a polarizer filter to darken blue skies. F.
58mm Slim Neutral Density ND1000 Filter . Fits any lens with a 67mm fliter thread. Manufactured using high quality materials, suitable for all lenses with 67mm filter thread. 1 x 67mm UV Filter. This high-quality UV Filter blocks the invisible UV component which is a cause atmospheric haze. ---High-Quality Crystal Optics Filter. ---Can be used on the lens all times. ---Reduce haziness or fogginess created by UV light. ---Serving as a protective shield for your other lenses. ---The filter can absorb ultra-violet rays to give added warmth and better colors. ---Front thread available for convenient coupling with additional filters or lens cap/ cover. ---Compatible: --- All 62mm lens of Dslr Cameras. I have a quantity available as shown. You are buying one item here at this price. This filter does not affect the overall colour balance of a shot. Better than Linear A circular polariser differs from a linear polariser in that it contains quarter wave planes in addition to the linear polarising filter. Neutral Density (ND) filters can reduce the intensity of light without appreciably changing its color. Classic ND filters have different f-stop reduction numbers and transmittance thus generated can be applied for different shooting conditions, such as portraiture, water falls, fountain etc.Our ND Fader is a compact all-in-one variable neutral density fader filter that adjusts the amount of light reduction with just the twist of your wrist. The index marks on the filter let you know exactly the amount of reduction at a glance. Giving you clear and precise shots at whichever density you are using. It is able to adjust neutral density freely from ND2 to ND400. You only need to carry one single filter with the same capability with ND2, ND4, ND8 ND16 ND32... and. For 3pcs ND2 ND4 ND8 ND Filter Set To enable slow shutter speeds to be used, especially with fast films, to record movement in subjects such as waterfalls, clouds, cars, seas, etc. To decrease depth of field by allowing wider apertures to be used, which helps separate subjects from their background. To decrease the effective ISO of high speed film (ie: above ISO400) and allow it to be used outdoors in blight situations. To allow cine and video cameras (which have fixed shutter speeds) to film subjects such as snow, sand or other bright scenes which would normally cause over-exposure. For 3pcs UV CPL FLD Filter Set. Absorbs the ultraviolet rays which often makes outdoor photographs hazy and indistinct. This multi-purpose, all-around filter can serves as a permanent lens protector. Filter Accessories. Digital multi-coated filters greatly reduce the appearance of lens flare and ghosting caused by reflections. Polaroid Optics 58mm CPL Circular Polarising Filter BRAND NEW. 5 out of 5 stars - Polaroid Optics 58mm CPL Circular Polarising Filter BRAND NEW. 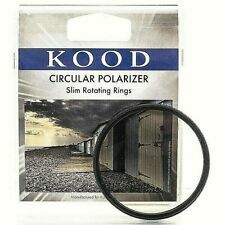 2 product ratings2 product ratings - Polaroid Optics 58mm CPL Circular Polarising Filter BRAND NEW. Phot-R 77mm PRO Slim Digital UV Ultra Violet Threaded Filter Lens Protector. Condition is New. Dispatched with Royal Mail 1st Class. Please see my other items including my mengs camera equipment. 62mm HD Circular PL CIR-PL Filter High Definition CPL 62 mm. UK Orders ◆ Shooting through glass, can eliminate the reflective glass surface, more clearly capture the stuff inside. Circular & Threaded Filters. Thread Size: 49mm. Lens Hoods. Lens Hood Accessories. Improves contrast by minimizing the amount of ultraviolet light. This gives astounding sharpness and clarity to all your photographs. 95mm HD Circular PL CIR-PL Filter High Definition CPL 95 mm. UK Orders ◆ Shooting through glass, can eliminate the reflective glass surface, more clearly capture the stuff inside. Marumi UV filters will block ultraviolet rays, and are most effective for distant photography. A ‘must’ filter for shooting in coastal and mountainous areas in fine weather. This effect is often used to increase the contrast and saturation in blue skies and white clouds. Hoya's polarising filters do not affect the overall colour balance of a shot. Circular & Threaded Filters. 1x Kenko 37mm UV Filter. This UV filter is a useful tool to minimize the affection of Ultraviolet Rays. Ultraviolet Rays will cause a bluish cast in your photos and it often makes outdoor photographs hazily and indistinctly due to the Ultraviolet Rays cause atmospheric haze. (Neutral density can be adjusted from ND2 to ND400, and it is easy to create different neutral density by rotating the ring. 4) ND400: Being able to lower 9 levels aperture and light quantity, perfectly suitable for sun-shooting with long-exposure. 40.5mm UV Digital Filter Lens Protector -. This high-quality UV Filter blocks the invisible UV component which is a cause atmospheric haze. Fits any lens with a 40.5mm fliter thread. Manufactured using high quality materials, suitable for all lenses with 40.5mm filter thread.